As a massive fan of my blog, you'll know more than anyone that I am passionate and committed to bringing you the latest in leading edged break through innoveightional ultra running solutions. So when a household brand approached me exclusively to check out their latest toy I almost Strava'd my pants. I had so many questions. Are you going to give me free stuff? Are you going to follow me on twitter? There was only one answer here. I think I got a #FKT on saying "HELL YES!!!!" Before I blow your mind with this let me paint you a picture. You are booming off a gnarly segment with 3.4% vert and 12a graded technicalised bogditch. You are ahead of time in gaining record time for the Teddybears Picnic. You need that extra push so you reach into your race vest for some gummy bears (oh the irony). However they slip from your hands as you pull them out. Round and round the garden they go, or straight onto the floor. Now you have no energy to make that final 10ft of climb. If only there was a way of keeping them dry. Or you are racing along the river. The bouncing is playing havoc on your bowels. It's raining so there are not many people around and you duck behind a hedge and lose the intestinal ball and chain. But you reach into your pocket and pull out a sorry soggy mess of paper. It used to be Kleenex quilted, now wilted. You do the best you can but are now worried about the next checkpoint, worried you'll forget which hand you are not supposed to dip into the cocktail sausages. Or you are 30 miles into a training run, it's hot, you find a shop and are overjoyed as you remembered to bring a tenner for such an occasion. Disaster! Upon slamming your 2 for £1.50 mountain dews and a couple of Ginsters pasties on the counter your money is greeted with the response "Seriously? I can't accept this. You've been rubbing your ballsack against the Queen's face so hard she now looks like Camilla". But my friend all of these problems are about to go away. Here it is. 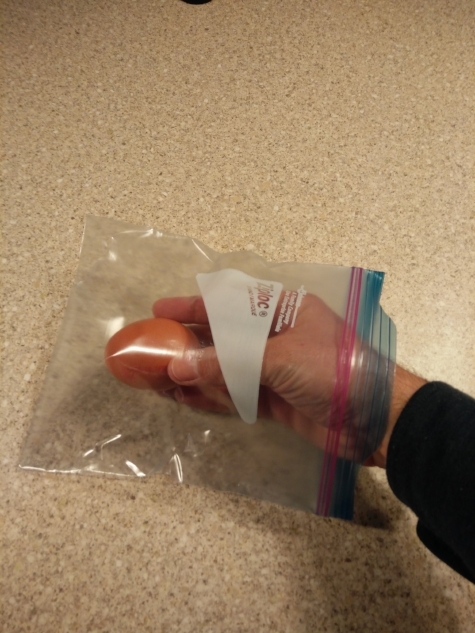 Introducing the Ziplock Sandwich Bag. 100 years of precision engineering that fits right in your pocket. Looks simple enough, but this baby is packed with features. First is the unique "photo-flex" material used to produce this that allows you to see things inside it. So long we have struggled with bags where we have to guess what's inside like some awful game show. They have invented a way of allowing light atoms to pass through the membrane of the bag while dark atoms are destroyed on contact. Sorry to blind you a bit with the science there, I'll try to keep my language simple for you idiots. The second great feature is this herma-squidge sealing device. It can be operated by any being with oppose-able thumbs which acts as a great security feature against farmyard animals and their pranks. Here is a picture of me placing an item into the bag. And here is a picture of me removing an item from the bag. The third astonishment is it's ability to flex itself to wrap around any item you chose to place within. When you take it out of the box you might be alarmed that the most robust thing you can fit in there is a beer mat but look deeper and you can see that this beast is like a shape-shifting chameleon, on cocaine, making waves in the batmobile. Yeah it flexes to be whatever you want it to be. Here are just a few of suggestions. The handy rite-space gives you up to 157 characters to label the bag according to your needs. More that twitter! So in summary this is an awesome bag. I know you will say that I got given this bag for free and so obviously I am going to say this is awesome. However if I merely say the words "unbiased" and "objective" and say just one thing I didn't like about it then that fully compensates for your doubts and you should believe whatever I say. It didn't store the egg that well. Here is a picture of my face with the bag. Just in case you want to put in on a billboard. Q - Is it #Paleo?